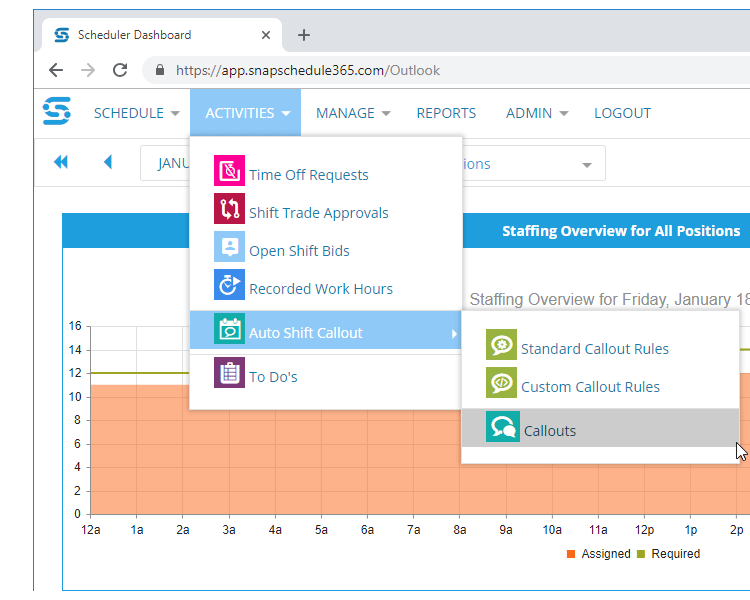 The automated shift callout and notification features in Snap Schedule 365 will let you accurately and quickly find and contact the right employees to fill open shifts, to meet emergent work demands, or to restore services. Snap Schedule 365 uses a rule-based callout system to analyze scheduling information in its database like employee’s work schedules, hours worked, seniority, availability, etc. and generate a ranked list of qualified employees in accordance with the criteria set forth in the callout rules. No more looking up union agreements to come up with a call out list and calling available employees over and over until a match is found. With a few clicks, you can tell Snap Schedule 365 when and how to automatically contact the employees on the ranked list until the required number of employees is filled. 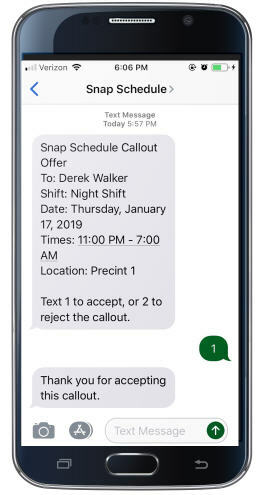 Your employees can accept or decline a shift by text message or on the phone and the interaction is logged and updated immediately in Snap Schedule 365. No need to sweat who’s on call or who should be called next. The shift callout feature is powered by a rules-based engine that takes the specifications you define then dives into the scheduling data already in Snap Schedule 365 to generate a ranked list of employees to call. whose work hours (including this shift) will not exceed work period limits. In generating the ranked callout list, you can further require employees to hold a specific position or possess one or more skills to be considered. Contact us if you have one-of-a kind union rules or business requirements and we can program a custom callout rule that match your exact requirements. Schedulers can manually contact employees using the ranked list if so desired, or set a date and time when Snap Schedule 365 will start contacting employees on the list, one at a time until the required number of employees is reached. Employees can specify how they want to receive and respond to callout and scheduling notifications, either via phone calls or SMS texting. Stay compliant and incorporate changes to regulations, union contracts, collective bargaining agreement requirements, staffing rules, and other regulatory policies into callout rules. Automated callouts reduce grievances by enforcing callout rules and equalizing overtime opportunities— bringing transparency to the process and improving productivity and work-life balance. Snap Schedule 365 provides 24/7, real-time status of crews. It tracks who accepted, declined, or did not answer and how many times an employee refuses a callout, which is important for equitably distributing work per the union agreement. 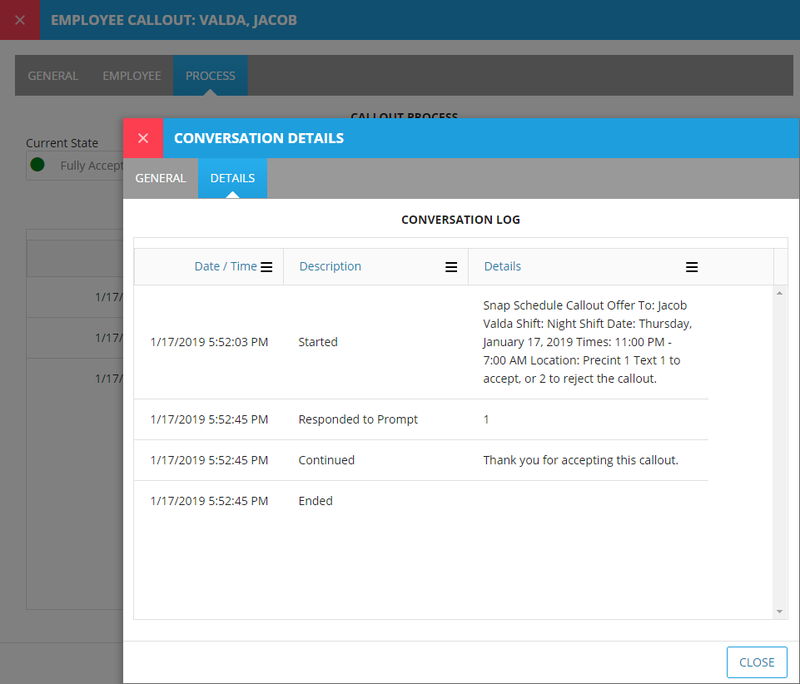 Unlike with a manual callout process, management and union representatives can instantly see employee’s the shift assignments, hours worked, overtime hours, and accurate data to support how the callout was done. Find out how Snap Schedule 365 can help you.